Summer is on the horizon. That means sweaty days and the quest to find ideal outdoor locations to sip summery drinks. For many, that means their rosé budget is about to balloon in a serious way. The Summer Water Societé understands this and is about to become family for rosé lovers. Their subscription service will deliver rosé to your door throughout the year's warmest months. Subscribers get six bottles worth of rosé at their doorstep every month from May through July. It won't help with your rosé consumption in other months -- and it has nothing for the shandy lovers of the world -- but it's a pretty nice start. For a $350 investment, it will drop three "magnum" bottles (each magnum has two bottles worth of wine) each month, along with little bonuses like hats and beach towels. While that price tag is big, it works out to just under $20 per bottle. 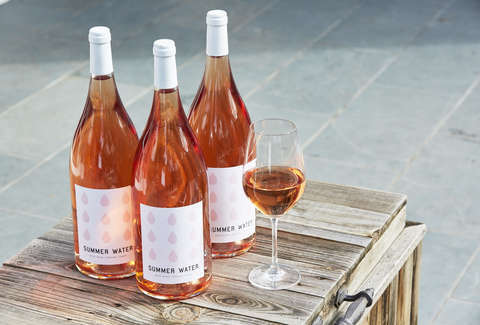 Summer Water Societé is a collaboration between the Winc Wine Club and Yes Way Rosé, the latter of which started as an Instagram account that spawned a rosé-themed online gift shop. Yes Way will provide the baseball caps and beach towels, while Winc keeps your cupboards stocked with a rosé they describe as "dry, light and perfectly crisp...with notes of strawberry, pink grapefruit, and white peach." The Summer Water rosé will also be available at retail locations in many states if starting with a $350 order seems like a big commitment to something you haven't had the chance to taste.